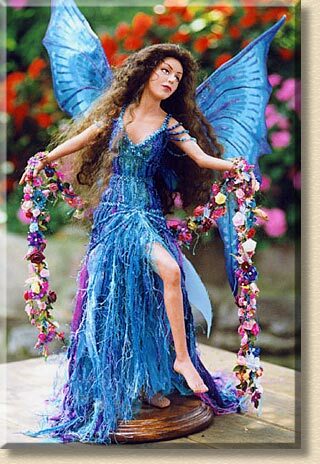 A beautiful longhaired fairy with blue wings and dress, dances through the garden with her garland of flowers. Media: Head, arms, torso and legs of Super Sculpey, on a wire armature with cloth body. She has long brown mohair. Her dress is made of blue organdy and cheesecloth with assorted fancy blue yarns overlaid with beaded girdles and edges. Her wings are sewn from fabric, inserted on wires protruding from her back. Props: She holds a handmade garland of tiny fabric flowers and satin ribbons.